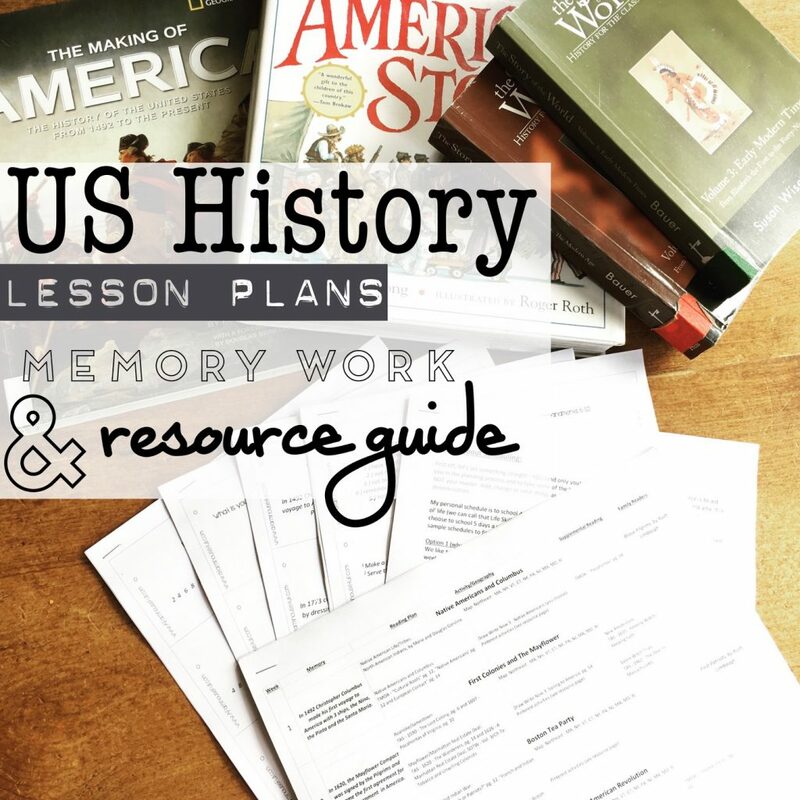 I am SO excited to announce that my US History Bundle is DONE! It is SO amazing and I can’t wait to hear your feedback! My US History Bundle is a FULL year of US/American History, geared toward children K-6th, but could be adapted for older kids by adding in some deeper level novels (think Grapes of Wrath, A Tree Grows in Brooklyn, Red Badge of Courage, Etc.) and an overview of American History of your choosing. A large and leveled book list to help you find readers that tie in with history for your independent readers. As a bonus I have also included 30 weeks of memory work for both Bible/Scripture and Math&English. 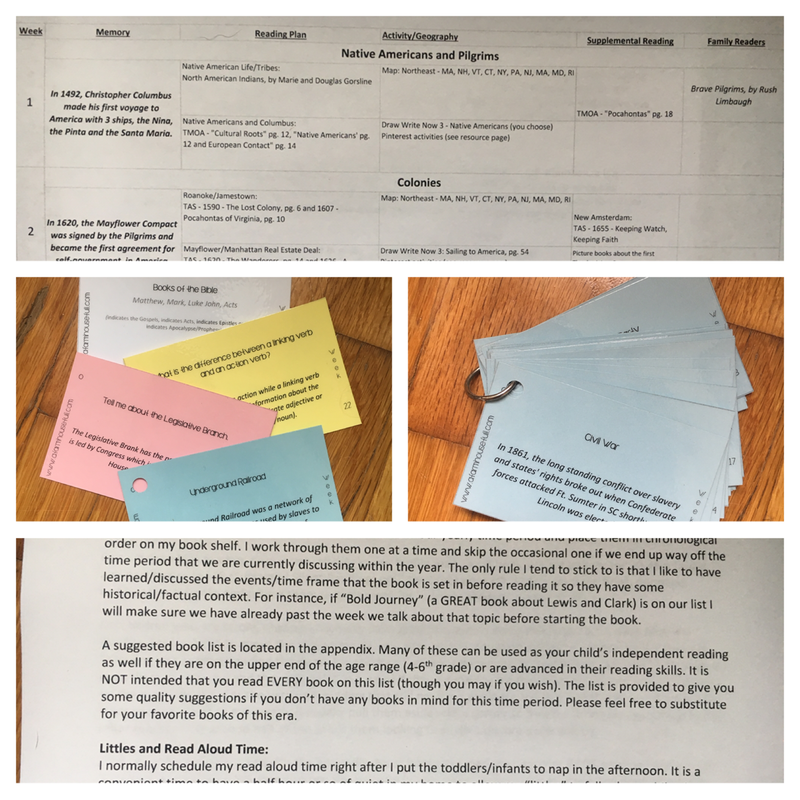 All memory work is set up as printable flashcards labeled by week! Click Here to see a sampling of what it includes! For a limited time I am releasing my History Bundle for ONLY $6.99! A WHOLE YEAR of US History for less than a fancy coffee! I want every family to be able to enjoy a SIMPLE classical/whole book approach to learning about US History! I am new to homeschool how do I go about teaching this to my kindergarder? I ordered the history bundle. I was wondering how long it will take to reveive it? It’s an immediate download. Let me know if you didn’t get it I will resend it! Just purchased and can I just say that I am so darn excited for this?! I just admire you and your family so much and love the way you teach. This will truly be a blessing as I am a single mama who homeschool a special needs kiddo thank you so much for this resource and God Bless You! Thank u for putting this together! I will be placing my order soon. Just bought this on my iPad… How do I get to it on my computer to print it off.? Btw I’m super excited to use this! I bought the bundle and hope to win. But I found the download process confusing and lost the link. Please help! Hey Nicci if we buy it and then we happen to win the giveaway can we be reimbursed? The giveaway is for the actual book, not the bundle. You’ll receive either SOTW Vol.3, SOTW Vol. 4, The Making of America or The American Story! I ended up accidentally uploading my non-edited (SUPER ROUGH) draft of a couple pages in the original upload. I resent you to update. The most affected pages were the English/Math flashcards (ironic, huh!?) Make sure you re-print the English/math flashcards! Sorry for the inconvenience! I want to Thank You for putting this together for all of us. I got the bundle and poured over it last night. This is going to be so fun. Anyone who is looking to homeschool and use this. It is worth the money. Go get it now. So excited about this bundle!! Just paid and awaiting to download.